When I read Cinder last year, I really liked the way Meyer blended the sci-fi / futuristic elements of the story within a loose framework of the original fairy tale – rather than sticking too rigidly to it and writing a simplistic re-hash. Looking back now, I think I preferred the second half of Cinder to the first, which is perhaps why I liked book 2 better than the first overall. I have to say that the cover didn’t grab me in the same way that Cinder did – the cyborg foot in the slipper was what drew me to reading Cinder in the first place – to be honest, if this had been book 1 I’d probably have skipped over this one, as it doesn’t have the same intriguing originality of the Cinder cover. That said – even after the first couple of chapters, I had a feeling this was actually going to be better! Scarlet is a great character, and splitting the novel between her and Cinder provided a nice variation and created a good pace throughout – I found it difficult to put this down and was always wondering where it was going to go next. Scarlet’s story – once she meets Wolf, street fighter and ex-Wolf gang member – is intriguing; as a character she’s pretty feisty and stubborn, which makes for interesting reading and contrasts Cinder’s gentler personality. The interplay between Scarlet and Wolf is good – always wondering how much you can trust him and how the ‘Red Riding Hood’ fairy tale piece would come into play. Just like Cinder, the fairytale elements are subtly done and when you pick them out, you may find yourself smiling at them like I did – I loved the chase through the wooden forest – visually you could see it making a great scene in a film of the book. I think the wider story, beyond the fairytale, comes into play more in this book. A lot of the groundwork from Cinder is now developing into a very full and interesting world. The escalation of the situation with Luna and also the glimpses of their society you get now indicate a much wider piece that is sure to come into play next time..
So…why does it get a 5* review? Well, I struggled to put the book down every time I had to; I would have picked up book 3 as soon I finished this one if I could! And I’m still thinking about the characters now and wondering where everything is going to go next….I can’t believe we have to wait until 2014 to find out! 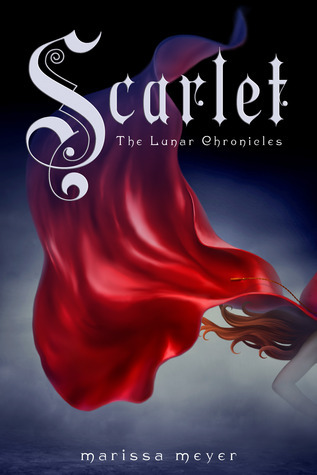 This entry was posted in Reviews and tagged 5*, Cinder, marissa meyer, review, Scarlet on February 21, 2013 by mel.